The attempted coup d’état of January 23 in Venezuela is unique in one respect: it was promoted and organised openly and publicly by the government of the United States, supported by its allies and client states in Europe and Latin America. One hundred years ago the United States declared its right to intervene wherever and whenever it liked in Latin America; but in modern times it never acknowledged its crimes, though they were well known. The Venezuelan coup, however, was openly called for and organised by the US government, which meanwhile enforced crippling economic sanctions. An insignificant young man, Juan Guaidó, chairperson of the National Assembly (which is itself in contempt of the Supreme Court), was encouraged to declare himself “president of Venezuela.” He was tutored by vice-president Pence of the United States, who phoned him on January 22, and he obediently declared himself president the following day, claiming that the election of Nicolás Maduro last May was invalid, and therefore the presidency was vacant. 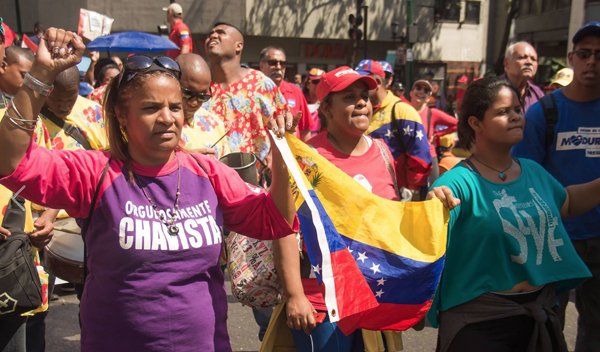 There followed a campaign of anti-Chavista marches, some of them quite large, accompanied by a few violent incidents in an attempt to create a breakdown of public order, which might be used to justify foreign intervention. The Chavista marches in support of the government were, of course, many times larger, though this was not reported in the corporate media. The coup attempt did not get much traction among Venezuelans, even among opposition supporters, only the extreme right. The governor of the state of Tachira, Laidy Gómez, for example, was strongly opposed, as was Henrique Capriles, a former presidential candidate. The date set for the intrusion and the contrived excuse for intervention was February 23. Trucks containing supplies, along with Colombian police and military, as well as followers of Guaidó, gathered on the Colombian side of the bridge connecting the two countries, with Venezuelan police and military on the other side. Two trucks were set on fire as a provocation, so that the Venezuelan authorities could be blamed; but the intended armed conflict between the two states did not materialise. The United States, perhaps a little chastened, has not carried out its threat of invasion; but Pence is talking as belligerently as ever, and new sanctions have been announced. The coup has failed completely. But the Latin American oligarchies and their imperialist backers in North America and Europe are desperate to restore their hegemony over the continent, and to suppress the Bolivarian Chavista process and eliminate the threat of socialism. In 2004, when the coup d’état against President Aristide in Haïti had collapsed, the United States, France and Canada intervened directly, kidnapped the president, and brought him to the Central African Republic, a French client state. A direct intervention is still a possibility, and the illegal economic sanctions and the theft of Venezuelan state property by the United States and Britain continue to cripple the economy and cause great hardship for the people. Yet the Venezuelan people are not conceding: they are heroically resisting, they are resolved to continue the program of Hugo Chávez for independence and social progress.